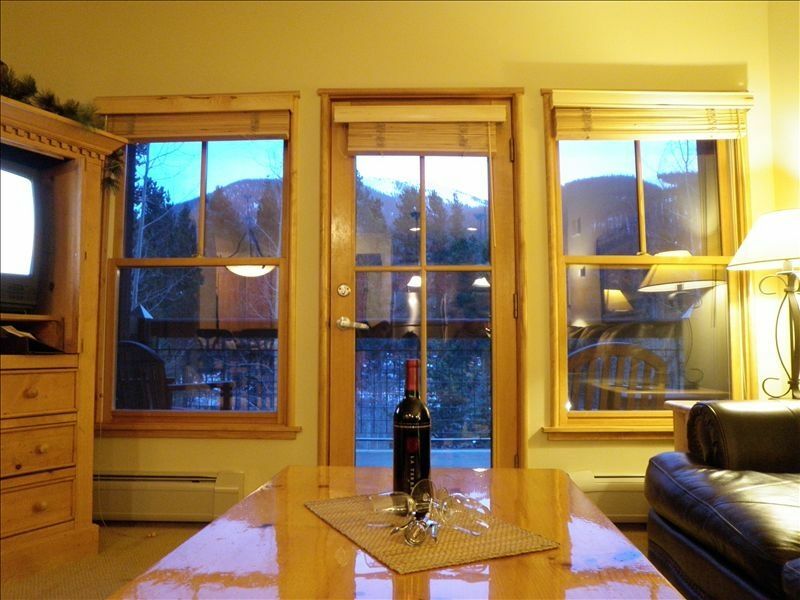 Next to Gondola*Beautiful Slope Views*King Beds*Great Rates! JACKPINE LODGE is located in the heart of River Run Village. Just steps from the gondola, it is the closest condo building to the gondola in River Run, with quick walk across the bridge. Shopping, restaurants, coffee shops (Starbucks) entertainment and skier amenities are just out the door of this unit. No need to drive anywhere. Park in the heated parking garage, and ride the elevator to the unit (unit comes with ski locker on main floor). SHUTTLE SERVICE to Breckenridge, Copper Mountain, Araphahoe Basin and to the other Keystone areas (Mountain House and Lakeside Village) is available. SLAB GRANITE countertops have just been installed in the kitchen and bathrooms, as well as new lighting, warm paint colors, new carpet, slate tile and all new appliances. The unit didn't need it, we're not asking extra for it - we're just hoping guests enjoy and appreciate the novelty finishes as much as we do. EXTRA ROOMY - At over 1000 sq feet, this unit is larger than most River Run 2 bedroom units. The oversized balcony (8' x 15') overlooks the Snake River, the slopes, a walking path, and has snow-capped mountain views. In spring, summer and fall, open the windows or sit on the balcony to enjoy the sound of the river. In addition to the king sized bed, the master bedroom has a desk area, TV, sitting area and full sized closet. Second bedroom has king size bed, TV, sitting area and full sized closet as well. The living room sofa converts to a queen size bed for extra guests. Keystone area has 5 CHAMPIONSHIP GOLF courses. Dinner sleigh rides, Adventure Tubing and ice skating are available through the resort. Keystone is the only Colorado ski resort with night skiing. Cancellation Policy - A full refund* will be made if a cancellation notice is received 45 days prior to arrival date. After that date, 50% of rent will be refunded. *3.5% cancellation fee applies to any cancellation if booking was paid with a credit card. Slope View - Jackpine is the closest River Run condo building to the gondola. ~50 yards behind the Jackpine building. We have stayed at Keystone several times in the past. This was our 1st time in JackPine & it was by far the best location yet. Could not be any closer to the Gondola & the condo was very spacious. I was afraid being above the hot tub would be too noisy but it wasn’t bad at all. Given the location & size of the condo, I thought the rental rate was pretty reasonable. Would definitely stay in this unit again. Great location. All you need for two couples. Very nice! Easy checkin and overall great experience. Condo was in great shape and we'll decorated. Location was right off the main gondola, and above a great bar/restaurant. Can't beat that! This is a nice unit that shows a little of the rental wear. It's spacious, especially the bedrooms and master bath, but has too much large furniture in the living area which makes that part feel a bit cramped. You can't beat the location in the Village and about 200 yds. to the gondola. A ski locker in the lobby makes it super convenient for skiing. This unit is directly above the hot tub and a restaurant/bar. That makes it quite loud at times, especially when the bar dumps their empty trash/bottles into the dumpster at midnight. The kitchen is well stocked but lacks in storage, so don't bring a bunch of groceries unless you want them on the counters. We had a few maintenance issues, like the master bath not draining and some lights out, however a call to Summit Cove resulted in very quick maintenance service (they were great!). Overall, a nice place that shows a little age. Would rent here again but in a unit on the opposite side of the building. Our vacation was amazing! We will be back! Everything was great with our stay. The place is beautiful and exactly as described. Guest will pay $95.00 cleaning fee.